Mohan's Blog and Viewpoints: RIP Steve Jobs , but Innovation lives on with the world's cheapest tablet?! RIP Steve Jobs , but Innovation lives on with the world's cheapest tablet?! For a generation of technology professionals who caught on to the offshoring wave, prompting the (re) definition of Flattening World [apologies Friedman], it is heartening to see the next wave of kids in the East with a device that can further flatten the world. It is almost prophetic to see tablet computer, that caught the fancy of western world also moving to the bottom of the pyramid. 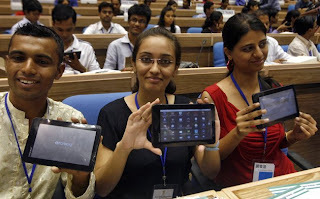 While the brouhaha over the cheapest tablet dies down, Indians must continue to ponder if they want to continue to be after the “Worlds Cheapest” lable? Remember a similar hype over "The World's Cheapest Car" when Tata launched Nano?